Why your character's catastrophic actions make for an unforgettable shooter. In Why I Love, PC Gamer writers pick an aspect of PC gaming that they love and write about why it's brilliant. This week, Sam enjoys the madness of Spec Ops: The Line. Uncharted is voice-and-mo-cap actor Nolan North’s most famous work, casting him as Whedonesque, likeable treasure hunter Nathan Drake. One common criticism of that PlayStation hero is that he’s presented as a positive, empathetic protagonist who experiences no trauma from his actions, despite gunning down hundreds of baddies. That’s now a very tired point, but it’s also why his casting as Captain Walker in 2012’s Spec Ops: The Line was such a smart call. Walker starts that game as an action hero too, sent into sandstorm-ravaged Dubai to find out what’s happened to former brother-in-arms John Konrad and his battalion, the Damned 33rd. That’s all the mission is supposed to be: reconnaissance. But under your control and against orders, Walker engages with the conflict—playing what he thinks is the role of the hero, despite never being fully aware of the facts. It’s soon apparent that the 33rd’s methods aren’t sound, and that at the very least they’re torturing CIA agents and firing on other soldiers. Stopping them is not your job, but Walker and his gung-ho pals decide it is, for the greater good. No wonder this game seems to have generated more think pieces than copies sold. It was the noisy release of the PlayStation’s Uncharted 4 that got me thinking about Spec Ops again. Nolan North was a subversive casting choice—who better to portray a protagonist who kills as many people as a typical videogame hero, but exists in a context where those actions finally have consequences? This meta commentary was not deliberate: North worked on the game for four years, right from the pre-production stage, which may explain why Walker’s increasingly weathered rage and gradual disassociation with reality is so convincingly played. What accidental good fortune, that the actor behind one of gaming’s most well-known icons plays someone who tries to be a hero, but comprehensively fails. Spec Ops is essentially an adaptation of Heart of Darkness, as the name John Konrad suggests. Heavier inspiration comes from Apocalypse Now, itself an adaptation of the same work. In all versions of this story, the protagonist is sent to track down a colleague who has gone off the reservation. That journey takes them through a strange land, where the circumstances and environment become stranger the closer the hero gets to their target, a process represented perfectly by the river in both the book and Apocalypse Now. The quarry in each story is found to be playing god over their new domain, succumbed to a form of madness created by the circumstances of their surroundings. I think Spec Ops is as valid and interesting an adaptation of this story as Apocalypse Now. It lacks the river as a metaphor for the journey, but it’s cleverly molded around the tropes of third-person shooters, leaving just enough control to make you feel complicit. It plays on your desire to press the trigger at any opportunity, and even breaks the fourth wall during a turret section to comment on repetition in these games. But more so than Apocalypse Now—where Willard’s journey to Kurtz morphs him from the army’s reluctant assassin into a man who no longer associates himself with the army at all—Spec Ops is Walker’s journey into becoming Kurtz. “Do you feel like a hero yet?” Konrad asks in the game’s finale, after hours of wearying, increasingly violent firefights against the 33rd and everyone else in Dubai. You spend the game thinking you’re chasing the warlord of Dubai down, but you’re turning into him. With every reckless action, with every disobeyed order, with every instance you pull the trigger—even when the game doesn’t make you do it—you’re accelerating that transformation. The ending underlines that notion in a pointed, metaphorical way, explaining the horrific reality of what Walker has brought upon Dubai, and finally detaching him from the selfdelusional sense of heroism that’s powered him through to this final moment. The ending offers choices that result in four possible outcomes, but it’s hard to believe there’s anything left of Walker, no matter which path you pick. I chose an ending where he simply walks away from the chaos, as close to a ‘good’ ending as this bleak finale allows. Spec Ops left me emotionally exhausted. I think the first thing I played after finishing it was Sonic 2, just to cleanse my palate a bit, since it’s a little lighter on the dehumanising effects of war. 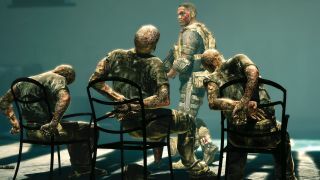 The carnage deliberately goes on for slightly too long in Spec Ops. It beats you down, tires you out, in an effort to make your own state of mind align with Walker’s. No other game has tried anything like it, and as a result it’s one of the only cover shooters I’d recommend without question.